Netflix, Rockstar, LinkedIn - this week we look at the tech world in the TJ newsflash. Kathleen Pai gives TJ practical tips for building your remote workforce and keeping your culture too. 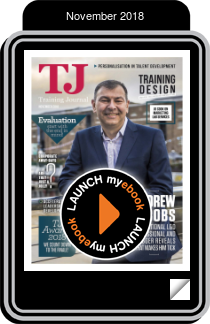 Andrew Jacobs, the inspirational L&D professional and blogger reveals what makes him tick. For Nathan Sykes, an obvious place to draw inspiration for training skills is in consulting. Kimo Kippen says leadership development needs to change. Phil Howard looks at the commercial side of apprenticeships. TJ will be hosting a one-day conference to support our evening of celebration at the TJ Awards 2018. Audrey Lamp underlines the versatility of online training. There's no death knell for CSRs yet, says Doug Taylor. Annabelle Fee gives us the basics of training effectiveness. Syed Uddin, The Adecco Group’s UK&I ‘CEO for One Month’ for 2018 offers his perspective on managing a multi-generational workforce. The game-changing part of having a successful difficult conversation is how you approach it, says Johnson Wong. New emerging technologies are fundamentally changing the way we work and engage with businesses, says Sarah Kaiser. You don't have to work in a physically demanding job to feel the benefits of a physiotherapist, says John Doyle. New co-host Kate Graham of Fosway joins Jon to discuss some recent news. It's never nice to hear, but there are ways you can cope with bad feedback, says Elva Ainsworth. Grace Carter provides her top tips for improving your business writing skills. Robin Kermode gives TJ his best tips for good body language, both real world and virtually.